The Returned and Services’ Association (RSA) has been a significant part of Wellington’s social, and at times political structure since 1916. It was founded in April of that year by people who saw a need for welfare, rehabilitation, job-finding and meeting-place services for physically and psychologically wounded soldiers who were beginning to return from overseas service in World War I. This is the story of Wellington RSA’s development, heydays, then relative decline, over the next 91 years. The RSA movement has been at the forefront of national debates about welfare, defence, duty, remembrance, sacrifice, welfare and morality. For its membership it has lobbied hard for pensions, land grants, medals, rehabilitation, welfare, disability issues and other rights. It has had strong links with the War Amputees’ Association, Disabled Servicemen’s Re-establishment League, as well as patriotic and canteen boards, and veterans’ homes. Of the many RSAs in New Zealand towns and cities, Wellington’s branch has been the most broadly influential because of its capital city location and because its establishment and development paralleled that of the national body. From earliest times until 1995 it shared premises and often staff with the New Zealand Returned Services Association and over the years has provided a high proportion of national presidents. 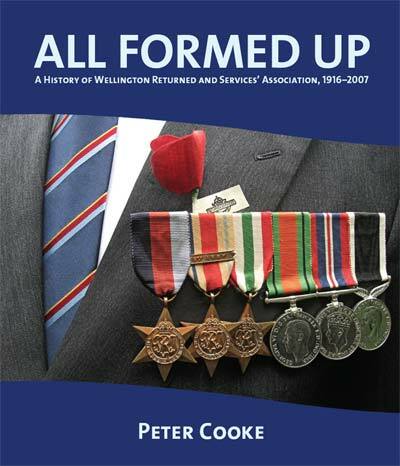 Peter Cooke’s history describes Wellington RSA’s colourful beginnings and chronicles the individuals and events that shaped its personality. • Handsomely produced hardback book with 231 pages and 215 illustrations. • Table of contents: click here to see the table of contents. • Index: click here to see the full index. Peter Cooke is an independent historian specialising in military history and industrial heritage. In 2000 he wrote the three–volume book Defending New Zealand – Ramparts on the Sea 1840–1950s and he edits the journal of the Defence of New Zealand Study Group. He has documented Shell Oil Ltd in New Zealand and Wellington’s water supply since 1867. Peter was junior editor on No Better Death – The Great War Diaries of William G Malone in 2005 and has written the official corps history of the Royal New Zealand Electrical & Mechanical Engineers, 1942–96.